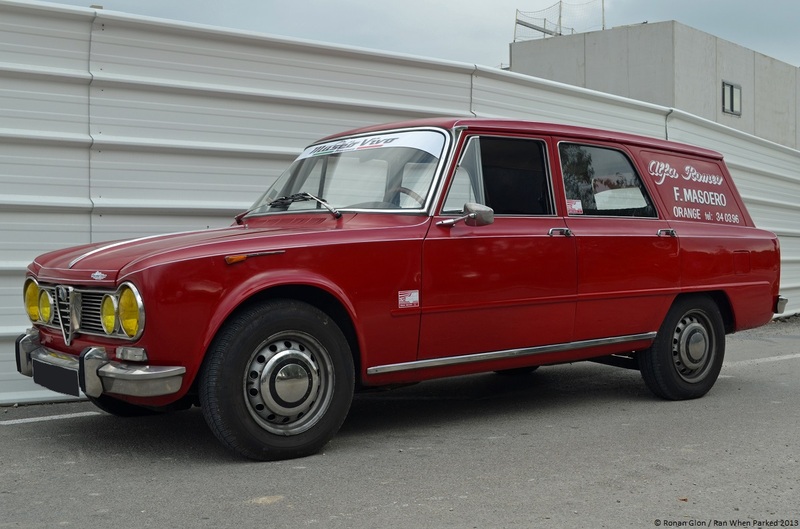 The Colli-built Alfa Romeo Giulia station wagon could be the poster child of the coachbuilding industry that thrived in Europe up until the early 1970s. Coachbuilders big and small specialized in modifying existing cars to make them roomier, more aerodynamic, faster or simply more practical while hoping to capture the attention of a major automaker and land a big contract. In the 1950s, Milan-based Colli experimented with several body styles for the 101-Series Giulietta including a stretched sedan and a station wagon. Alfa execs caught wind of the projects but they were not interested in adding either car to the company’s catalog so production remained low – Alfa’s own records claim most of the 91 101-Series wagons (also known as Promiscua) were ordered by the Italian police. Alfa still hadn’t decided to offer a factory-built station wagon when it launched the 105-Series Giulia in 1962 so Colli went back to the drawing board and again designed one in-house. Starting with a stock Giulia, the coachbuilder lengthened the roof panel, added a D-pillar, fashioned a hatch and created a flat loading floor by relocating the spare tire to under the car. Some of the Colli-built wagons were used by Alfa Romeo’s racing department and major dealerships as technical assistance vehicles; others were used as patrol cars by the Italian police force and the Carabinieri, two departments that maintained a sizable fleet of Giulia sedans in the 1960s. Research shows that the wagons were built from existing chassis numbers and Colli’s record-keeping appears to be non-existent so precisely how many wagons rolled out of the coachbuilder’s shop is a matter of massive speculation among historians. Other coachbuilders manufactured Giulia wagons in the 1960s including Grazia, Giorgietti and Introzzi, and it appears that Colli provided the wagon blueprints to several smaller coachbuilders all around Europe but precise details are again vague at best. Giulia wagons came in different flavors: A lot of examples had welded-in rear windows but some had a third side window and rear bench, and others had a half hatch that stopped above the tail lamps as opposed to a full hatch that stretched all the way down to the rear bumper. The Giulia Super-based example pictured below was delivered in 1967 to SOFAR, Alfa Romeo’s French division, and it immediately joined the company’s racing department as technical support vehicle. SOFAR used it until December of 1970 when it was transferred to ex-factory pilot Fernand Masoero who kept it as a shop car for his Alfa dealership in Orange, France, until it was deemed too old to use on a daily basis. The car was subsequently displayed in Masoero’s showroom for several years. The current and third owner is a life-long Alfa enthusiast who helped create the local Italian car club a couple of years ago. Although the Colli was partially restored about ten years ago by a previous owner, it is certainly not a garage queen and it is driven on a regular basis, sometimes towing other Alfas to and from events. Thanks to the owner for letting us take photos of his wagon and providing many of the facts and figures in the article above. And it can be yours for only 29500€! I’ll be damned, I had no idea he was selling it. I haven’t seen the owner since I took the pictures in October. @motoringconbrio. These cars are ultra rare and not so often on the market. It was fun to see a “replica – autostradale” in mint condition sold for 77k$ at auction in the usa last november. I guess, a lot of readers noticed the “barn find” requiring a total reconstructions sold for 9000 euros at retromobile auctions ! this is insane. The market is very narrow for such cars and I wonder what it an actual price when we see here in europe that a Giulia Super or TI in mint condition ares old for 20k€-25k€ plus.